The key to winning more deals always comes down to understanding your prospects’ business needs. Putting these five habits into play in your daily work as a sales professional will not only help you get in-line with your prospects’ needs, but be in position to solve those needs. When you have an understanding of your buyer’s processes, you can present your solution as an enhancement to their process. This is time to show your expertise and shine the light on your solution. Research how they win business over their competitors. What yardstick do they use to measure success in their industry? Your ultimate goal is providing them with the solution that improves their way of doing business. If you don’t know your buyer’s industry and their buying process, how can you engage in a meaningful conversation that shows you understand their business needs? Having specific knowledge of their industry puts you in a position of control. You will be able to speak to the pain points of your buyer’s industry and gain their trust. The most significant component to fishing is the fish. Studying where, when, and what they eat all add up to the success of catching the fish.You need to get past the mechanics of selling and focus on the buyer. It is really all about them. What do they want? Why not ask them directly? Go beyond the RFP and actually talk to your buyers. Ask for an onsite visit. You can learn a lot by watching your buyer in action. What lure appetizes your buyer? What is the one common denominator between the military and their contractors? Retired and former military personnel. It simply makes sense to work with people who know the programs inside and out because they lived through it. Who do you know who may have worked with or has some close relationship with this buyer? What insight can they share? 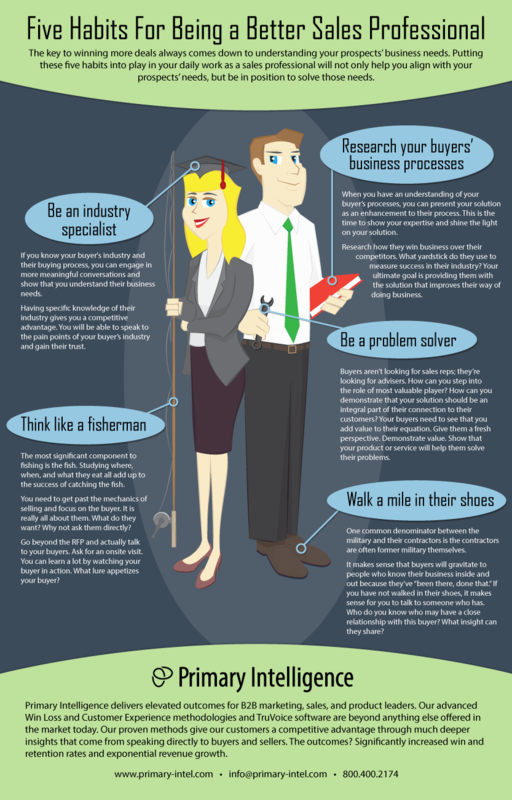 Buyers aren’t looking for sales reps; they’re looking for advisers. How can you step into the role of most valuable player? How can you demonstrate that your solution should be an integral part of their connection to their customers? Your buyers need to see that you add value to their equation. Give them a fresh perspective. Let them believe that they need you to solve their problems.